Belgard provides us with all manner of hardscape products – retaining walls, patios, walkways, and etc. – but they also incorporate major appliances and utilities in their stone patio designs to produce what we call Outdoor Living Spaces. It’s funny; we build these beautiful houses, insulate them and seal them up, but after we’ve turned on the heat and gotten everything cozy – we want to get outside. And a Ben’s Creek Nursery Outdoor Living Space with Belgard designs and materials is just the thing when the moment strikes. 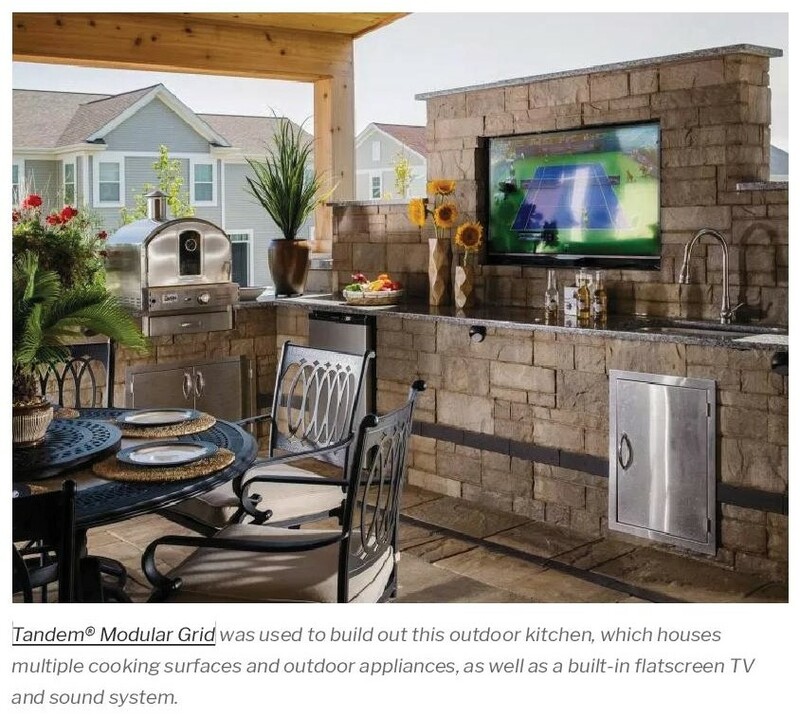 If you have had a thought about an outdoor kitchen, patio bar and the like, here is a walk-through of some of the things I saw recently leafing through a Belgard catalogue. Most of this is taken from Belgard’s website (with their kind permission), so if you want some further information, you can go here. Belgard Paves the Way with Ideas, Tips & How-To’s for Outdoor Design & Entertaining. These outdoor kitchens use multiple angles and countertops galore to create expansive grilling stations with ample prep and serving space, as well as bar-style seating, which allows the guests to keep the outdoor chef company. With a classic L-shaped grilling station, everything you need is within arm’s reach, which makes cooking and clean-up a breeze. Gourmet outdoor chefs can’t settle for just one cooking method. Outdoor kitchens and grilling stations don’t have to follow the limited linear rules of an indoor cooking space. Get creative with curvy designs. You can’t go wrong with the classic look of brick. For a unique design, sometimes you have to think outside the box. Even when space is at a premium, you can still have an eye-catching outdoor grill. Some folks want an outdoor kitchen and built-in grill that offers all of the convenience and “creature comforts” of the indoors. There’s just something earthy and fabulous about combining the looks of wood and stone together. An excellent way to do that is by adding an arbor to your outdoor kitchen space, which not only filters the sunlight, but adds pop to your outdoor living design.